Murder on the Toy Town Express is a fun read for cozy mystery fans, and anyone who loves retro toys will especially enjoy it. I love all things retro, including vintage toys, and sometimes sell a few vintage toys in my online shop, so I especially enjoyed this book. Liz works with her father in his vintage toy store in East Aurora, New York. When they work a vintage toy show, she is shocked when her high school bully, now a comic book dealer, dies suddenly. With the help of her father, friends, and semi-boyfriend, Ken (who also is police chief) she becomes involved in working to solve the crime. This was such a fun read! I couldn't put it down. The characters are quirky, interesting, and likable. And there are twists and then more twists. I am usually pretty good at solving mysteries but did not have this one figured out until I was about 75% in! This is the second book in the Vintage Toyshop Mystery series. I have not read the first (yet! ), but this book worked fine as a standalone mystery. I loved, loved, loved the vintage toy details in this book. As well as great details about model trains, there are mentions of toys like The Addams Family Card Game, The Beatles: Flip Your Wig Game, Candy Land, Life, Lite-Brite, and more. At one point the characters have a 1970's games night featuring Yahtzee, Risk, Clue, Mousetrap, Rebound, Which Witch, Sub Search, and Manhunt. The party was complete even with '70's candies: Good & Plenty, Milk Duds, Necco Wafers, Chuckles, and Sky Bars. I enthusiastically recommend Murder on the Toy Town Express to other cozy fans. It makes a great weekend read, and it is really fun! There are two (!) 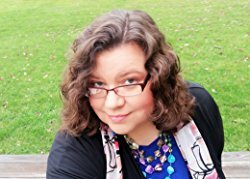 giveaways on this book tour. Book swag! 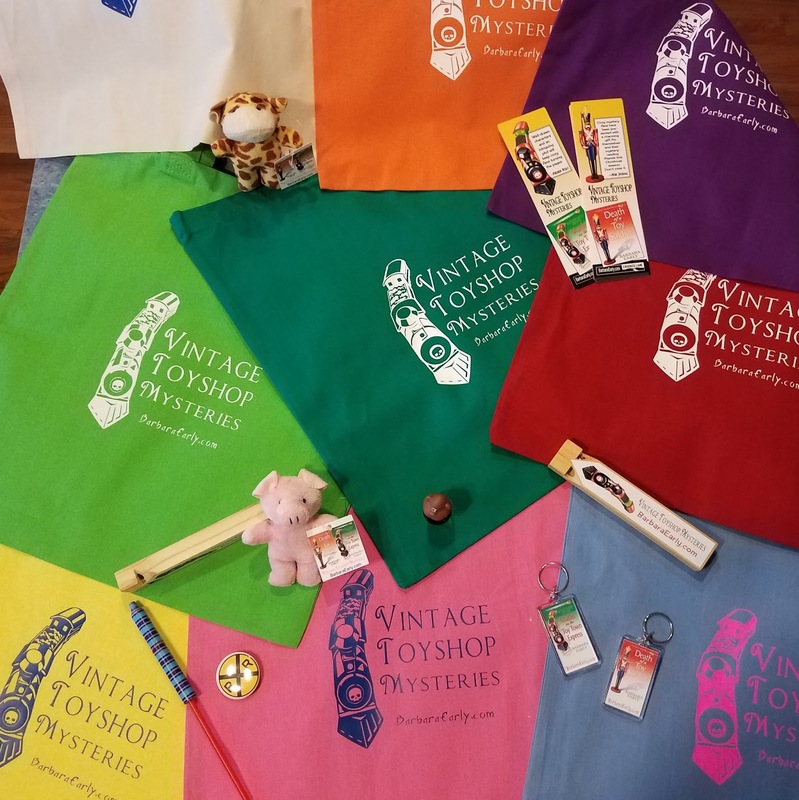 Prize is a brightly colored vintage toyshop tote bag, key ring, train whistle, bookmarks, and assorted fun Toyshop swag (color and selection will vary). U.S. Only. Ends 10/23. Prize includes signed copies of MURDER ON THE TOY TOWN EXPRESS (hardcover) and DEATH OF A TOY SOLDIER (paperback), a Vintage Toyshop tote bag, keyring, booksmarks, and assorted fun toyshop swag. U.S. Only. Ends 10/19. I received a copy of this book from Great Escapes Book Tour and NetGalley. This series looks so fun & I love quirky characters. Barbara Early seems like a well seasoned author. Look forward to reading her works. I really enjoyed the first book in the series. 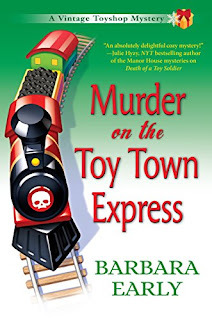 Would really like to read "Murder on the Toy Town Express". This would be a great holiday read. Looks like an enjoyable fun book! Sounds like a fun read! thanks for sharing the review and chance to win! This looks like a fun book, thank you for the giveaway. I love mystery books, and the cover is great. Having grown up near train tracks for most of my life I am very interested in anything to do with trains. This sounds like a great book! Thanks for sharing. Ooh, sounds like an interesting holiday read! I enjoy discovering mystery authors who are new to me. I also like holiday reads! My dad always set up his model train layout around the base of our Christmas tree so I love this milieu. My grandson would love this. He is obsessed with trains. This sounds like a fun read. Thank you for the review. this has to be fun to read! What a great series. Thanks for hosting. Precious books, great for kids!